On the last out-of-state excursion, I bought a cake tester for no discernibly good reason. Even in the moment I said to myself, This isn’t necessary. But it’s cute and cheap and if that purchase has risen to the level of extravagance, I am being true to my frugal roots to the point of being cheap. But does it work? Twice tested with the same results. And I’ll wrench my shoulder if I pat myself on the back anymore. The round-top one has been in use for years; it’s just a stout wire with a bit of a handle coated with something to make it a marketable item. The new one has a cake-shaped top stamped ‘cake tester’ in case you were to mistake it for something else. And there’s old reliable, the toothpick. Most receipes state that the cake is done when the tester comes out clean. And sometimes a toothpick is noted as the preferred tester. Also of note is the caveat that ‘clean’ really means a few crumbs sticking to the tester. Since I’ve a tendency to overbake ‘just to be sure.’ that is advice to be heeded. The results: The wire pulls out more crumb that either the new tester or the toothpick. 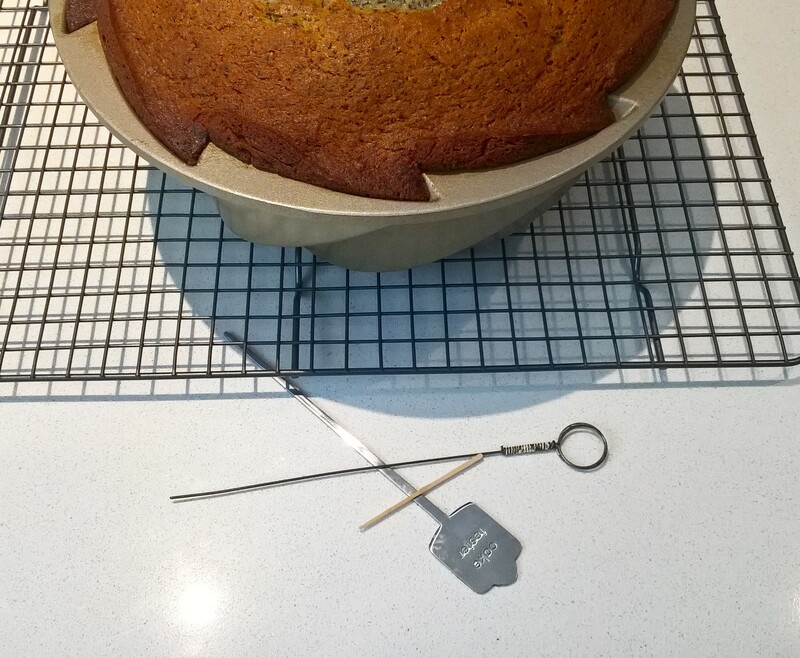 So my crispy-edge cakes may be avoidable using the new tester. Who knew? The sad news is that this cake was baked in the wrong pan, but that’s a post for another day. I wonder if you’ll get this? And thank you for a new tag line The tone! The humor! The educational info!